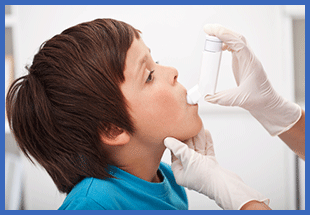 Asthma is a common respiratory disorder in both children and adults. While traditional medicine encourages the use of inhalers and other drugs to treat the symptoms of asthma, upper cervical care takes a different approach. Rather than reacting to the symptoms of asthma, upper cervical care seeks out the source of the condition by recognizing the important relationship between the nervous system and respiratory system. The respiratory center, housed in the brain stem, is the part of the nervous system that regulates breathing and helps the body adjust to physical demands by sending messages to the lungs when more air is required. The rate of breathing should naturally be adjusted to maintain proper oxygen and carbon dioxide levels in the body. If there is any interference in the respiratory center, the body will not adjust as it should, and asthma symptoms will occur. The respiratory center can be greatly affected by even minor misalignments in the upper cervical spine. Many upper cervical care patients find that correcting a misalignment of the top two bones in the neck not only reduces asthma symptoms short term, but actually helps the body learn to properly adjust breathing rates without the need for fast-acting inhalers or other drugs.